Residents of King Oaks contributed $1,575 to the fund, which was created last year. SouthStar Communities, the developer of King Oaks, matched donations up to $1,000. 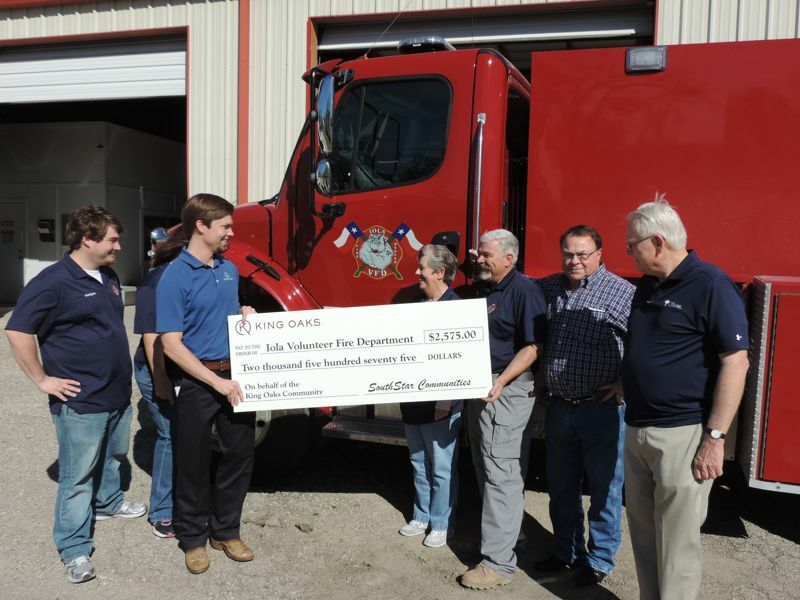 The Iola Volunteer Fire Department has 17 firemen on staff and plans to add two more. King Oaks is Bryan-College Station’s premier acreage community offering one to three-acre homesites for sale. King Oaks features an array of amenities including a 60-acre nature preserve and trail system, fishing pond and park and Amenity Center with swimming pool, outdoor kitchen, playground and tennis court. Boasting a multitude of elevations, King Oaks is the ideal community for those seeking a natural escape from the big city. Located within close proximity to Texas A&M and the best of Bryan-College Station, King Oaks is perfectly situated for games and campus events, yet its private location on the east side of Highway 6 allows residents and land owners to enjoy a relaxed, peaceful, country way of life unique to this community. For more information on King Oaks, visit www.kingoaks.com.